If you are playing a round on Saturday's don't book on line.Avoid paying those fees-only $25.00 for 18 holes on Saturday. 276-2385 to book your tee time. We do not book tees times thru this website. The Country Club of Newberry was founded in 1922 by a handful of dedicated citizens that were in search of a private facility to call their own for social gatherings, golf, swimming, and eventually tennis. At that time there were only a few other golf facilities in the middle part of South Carolina. Members donated time, labor, and materials to build the original Newberry golf facility and clubhouse. The original swim facility, a pond fed by more that seventy-five springs, is still fully intact behind the clubhouse. Members also maintained all of the original facilities including the original 9-hole golf course which utilized sand greens that were in effect until 1945. The back nine was completed in 1976 by combined efforts of the membership and management of our Newberry golf course. The basic design has remained intact since the additional and improved maintenance procedures have added to the playability of this classic design. 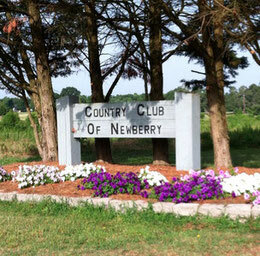 The Country Club of Newberry has a long and illustrious history of serving the people of Newberry and surrounding areas. Today's membership is dedicated to all aspects of being a part of such a historic club.